No matter what type of blog you manage, at some point it may be hard for you to continually keep the site updated with new content or even new ideas and topics for you to write about. In times like these you may want to start looking at some outside options for new content and maybe even bring aboard some new writers. There are lots of different ways to generate new content for your site, but the focus should always be on creating quality content. In the end, you want to keep your readers coming back for more. Don’t sacrifice your blog with poor quality content just so you have a new update every day. Since I currently run my own network of blogs, I’m always looking at new ways to come up with creative ideas to write about and also looking to bring in my writers to join my team. You can do the same by using any of my recommended resources below. In previous years, if you wanted to hire a new writer or someone to create content for your sites, you would have to ask friends if they know anyone or usually find some high priced writers through their web sites. Now there are plenty of content generation sites online that allow you to post jobs and find thousands of writers who are ready to start creating original content for you. Most of these sites are free to join, then you would post the type of content you would like written. The cost is usually a few pennies per word based on writer quality, but you get to approve the article before accepting and paying for it. A couple examples of these sites are blogging.org and textbroker.com. There is a massive influx of guest blogging requests coming through my network of blogs lately, which means you can start getting free content for your site as well. The important thing about guest blogging it to always check the articles for originality and quality. While the guest posts are written free for you, in most cases the writer will want a link back to their site in the footer area. Since Google is now against many unethical link building methods, many guest bloggers are actually selling their services of link building… which is why you need to check all articles for quality and that it’s not just trash to get a link back on your site to their clients. No matter if you are looking for writers, designers, programmers or anything else… freelance jobs sites have always been huge online. Since we are focused on finding quality content and writers, you definitely shouldn’t forget to add sites like elance, odesk.com and freelancer.com to your list of resources. All you need to do is sign up for a free account, post you job listing and you will get a ton of responses from people looking for work. Best of all you can view their resumes, work examples and portfolio of previous jobs. Just like there are freelance jobs sites, there are also blogger job boards which are focused solely on writing jobs on blogs. The most popular job board out there is the one on Problogger, but there are also many other free and premium alternatives for you to choose from. When you post a job on blogger job boards, you are looking for part time or full time bloggers that would like to write for your site. Include as much information as possible and always look for previous work from people who are going to send you your resumes. The best writers for your sites are ones that are truly interested in your blog topic and know what they are writing about. At the end of the job listing you can post your email or direct interested writers to a form on your site to fill out. 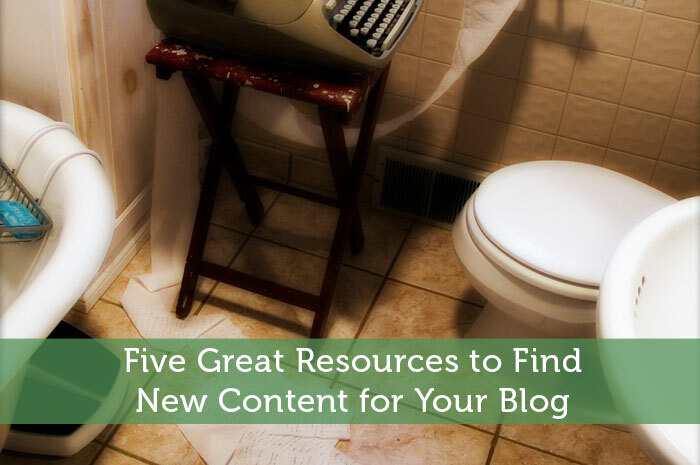 The last resource is using your own blog. How many times have you written a killer post on your site, only for it to get lost over the years? An excellent way to create new content for your site is to look at your previous posts you’ve written over the years, and update them with new information or spin them in different directions. This can be done for nearly any niche or blog topic. Find the posts that your readers like the most and try to create new and different angles with the same twist. Just doing this for one or two different posts per month can add an additional 15-30 new posts to your blog per year. As mentioned earlier, no matter what the direction is you take for generating content for your site, you will want to make sure the quality is still there. Some sites and writers will offer extremely low prices and they may also include extremely low quality content. Try each of the recommended methods above and see which works best for you and your blog. Does anyone use the content generation methods discussed by Zac? Obviously I’ve been hosting guest posts since I didn’t write this post, but I haven’t looked into those other options. Fortunately for me I haven’t run out of ideas yet. I definitely believe this will happen sometime over the next year but before I started blogging I wrote down hundreds of ideas for posts and I come up with new ideas quite often. While I may not need new ideas, I like the Freelance ideas simply because it will take some time off my plate and will serve as a great option when my work schedule becomes too busy. I did the same thing with writing down a ton of topics when I first started. Luckily I only need to scan that list on rare occasions when some other idea doesn’t come up that week. I know I’ll eventually run out of topics too, but I intend to take advantage of staff writers eventually to ease with that problem. I already use quite a bit of guest posts to help with the transition. These are all great ideas! Especially as a new blogger who has been hitting a wall lately with coming up with new posts. The few guest post requests I get are usually trash. I usually just ASK bloggers I really enjoy to do a guest post. I think it is great to remind writers that quality is key-I have definitely been feeling the heat from that lately too. Yes a lot of guest posts inquiries will just be some spammy marketing company outsourcing their writing overseas. Most of those ones are just interested in a link and don’t care about quality at all. So requesting guest posts from blogger friends is the best route early on. The other thing to keep in mind is that you are free to post on your own schedule. You don’t need 5 posts per week. Until I started accepting more guest posts, I was content with just 3 posts per week. I like to use guest posts and staff writers. To me this is the only way to guarantee good articles. I am skeptical of using article generation sites. You have no guarantee it isn’t plagerized etc. I think you do a great job of maintaining high quality with multiple writers. It’s a model I hope to replicate eventually. I know quality can be hit or miss when using too wide a variety of writers. I’d be wary of using content creation sites too. I’ve never accepted a guest post on our site. I would from a blogging friend, but not someone I didn’t know unless it was sponsored. I definitely think quality is key! These other options, I’d never heard of or thought of! The content generation sites? Crazy! I don’t think I would use them, but might be worth looking into! I haven’t needed such things yet, but they are definitely things to keep in mind. I do get a few emails a week about guest posts, but they always seem really sketchy. One thing I need to do more of us guest posting other blogs. I did a couple in my very early days, but haven’t really done any in a while. I think most blogs are bound to get those sketchy e-mails from spammy marketing companies looking for free links. Just know that there will eventually be legit advertising inquiries mixed in. I haven’t got into guest posting on other blogs yet, but I do intend to start soon. It’s definitely a great strategy, especially if you can get published on popular blogs. I just want to create some more beneficial pages to link to first. I like the idea of going back and updating old blog posts or spinning them with new material. I have tons of old posts since I started blogging long time ago (ok maybe almost 2 years isn’t that long ago) but they are stuck in the archives where I’m sure people aren’t digging. I agree that it’s a good idea, especially for a blog that has been up for a while. Even with my blog I know I wrote some decent topics early on that most people will never read. So eventually I’ll probably rehash those topics using my current writing style. This is interesting. It is hard to stay on top of what is new and exciting. You need to read Google News and see what the media is discussing and put your unique spin on it. Google News is one option, but not everyone just wants to focus on current event type topics. I try to instead focus on topics that are relevant in my life at the time. I would love to get in on the social sharing. do you have any tips for doing this? I’m just starting out with Debt Free Teen but I’ve been blogging over 4 years at The Surfboard Man. Any advice would be appreciated! Social sharing is pretty easy. Just share other bloggers’ content and many will reciprocate. I take that a step further and link to people to add some extra incentive. So feel free to tweet my posts 🙂 Sometimes some e-mail networking helps grease the gears. I’m with jason. I wrote out dozens of topics before starting. But it does get time consuming being this awesome (j/k). I need to look at possible guest posts for my blog with upcoming vacations, and I like the idea of spinning old posts at some point. i’m still under 3 months old, so it’ll be a while for that, but I’ll tuck that away in the corner of my brain cavity. Guest posts are especially helpful during vacations. Some of those writers will even help respond to comments which is a huge time saver. I prefer to mix them in each week just to free up my time for other work. Without them I’d be just posting 3 times per week. These are some excellent resources. I’ll admit I’ve hit writer’s block a few times and it has been rough. Right now I’m kinda leaning on the trick to re-use old blog posts. I’ve been enjoying your investment series lately. So you should do well with keeping that up, even if it is based on previous topics you’ve covered. I’ve added this page as one of my favourites under my “Personal Finance Blogging” folder. I have a list of ideas for posts and when I read other peoples’ pf blogs, I’ll see that they’ve already written about the idea. But I know that doesn’t mean I can’t put my own two cents on that topic. I’m a firm believer in “Quality is Key” as well. With being a newbie blogger, I feel the need to really generate quality writing to the best of my ability, so that I can attract more readers. Unfortunately we will all end up covering a lot of the same topics. In that case you could link to that post on the other blog or you could just wait a bit to cover that topic. It’s just annoying when you see someone blatantly taking the exact same approach as you with a topic knowing they got the idea from your blog. As a newbie blogger you should actually be focusing extra on marketing too. Early on it is tough for people to find your content. So I’d personally not want to waste too much of my best writing with posts that will go unnoticed. Of course your writing still needs to be good enough to keep people around. For a little while, I was accepting guest posts through a site called MyBlogGuest, but I found that a fair number of the posts were linking to a commercial site or just plain bad. I’d be careful with any kind of system like that where anyone can submit content to publish on your blog. It’s rarely quality writers who are submitting content on there. They would instead be contacting bloggers directly. Actually, the posts that were submitted to me tended to be of higher quality then the ones that were up on the boards looking for a blog to live on. A few times a post would look good from the preview but wind up being not so hot. I guess people just dump their rejected content onto the boards in hopes someone will use it. I just can’t be bothered to deal with lousy content. I don’t agree to accept any content for my blog before first seeing a writing sample. The list of post ideas is helpful sometimes, but I know what you mean about just not wanting to write about those topics sometimes. Certain days I just don’t feel in a writing mood and wouldn’t want to force some generic topic. It works out so much better if you just happen to have something relevant in your life to turn into a good post. Great tip about to just use your own blog and update old posts. The best thing about that is, you can look at your traffic and you will see the posts you could probably improve to get even more traffic. Very powerfull! Yep, you’d have a really good idea of which topics worked well for you in the past once you get digging into the stats. Or sometimes you cover a good topic early on but didn’t put enough effort into it. I know if I rewrote any of my early topics I’d probably take a very different approach. Twitter trend is also a good place to look for ideas. Good suggestion. That could uncover some good topics that are very timely and allow you to target them before other bloggers.